Calling all Kroger and affiliate shoppers! 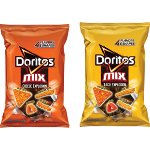 Hurry over here for this week’s Kroger Free item which is a Free Doritos® Mix™. This eCoupon is available for download today only, April 1st but you have until 04/17/2016 to redeem it. I love Kroger's freebie Friday!